Striking rufous-brown crown and nape in adult with large white shoulder patch on black upperparts.. Female is duller with more white/buff at base of bill and lower back and rump only slightly greyer than mantle. 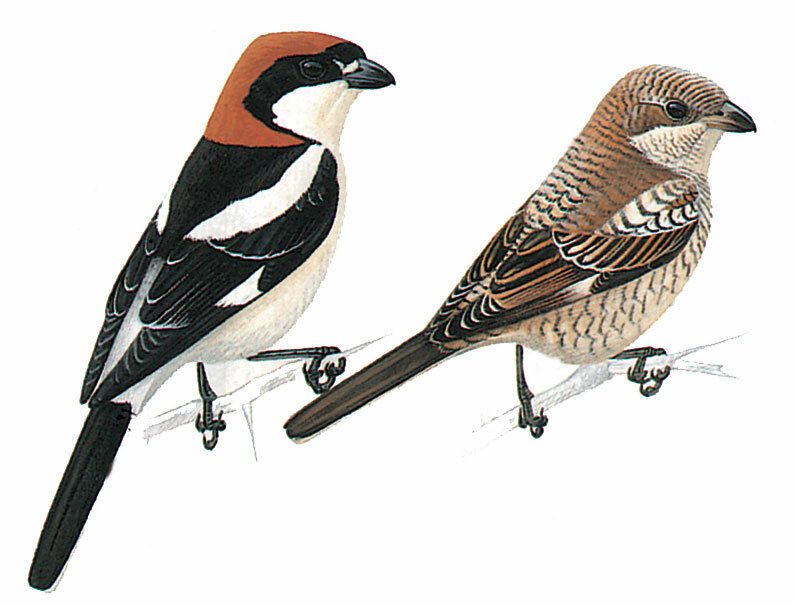 Juvenile and first winter birds resemble Red-backed Shrike counterparts, but upper parts of Woodchat Shrike are pale grey brown with creamy white marks on shoulders, wing coverts and rump, and base of primaries, forming a pale wing patch visible in flight. Juvenile Masked is greyer, with finer bill, longer tail and paler forehead. Undulating flight similar to other shrikes.